There is rarely a better time to be in the deer woods, chasing monster bucks, than during the middle of November. As insanely good as the hunting can be, it can also leave hunters extremely frustrated because the encounters are often so random, and quick. In order to bring some advantage back into our court, we often look to everything and anything that can help us do just that. From lures to calls, there are a lot of options. One that has been gaining more and more attention is the use of decoys. As the length of daylight (photoperiod) shortens, the testosterone levels begin to rise. These levels top out during the middle of November. Think of it like someone who shoots up with intense steroids. These natural steroids drive a buck mad, and he struts around looking for two things: a girlfriend and a fight. This is where your decoy can pay huge dividends. Though you may get attention outside of the month of November, now is the time to use them. Probably the least utilized option is to use your decoy like a doe. Though it can be very successful especially in wide open areas as bucks are cruising, it’s not as easy as you might think. First off, the buck has to find the decoy. This is much easier for buck decoys, which we will discuss in a bit, but there are two options for doe decoys: lures and calls. This isn’t any different really than using a buck decoy, except that we are limited. For calls we can use a bleat or estrous call that mimics a receptive doe, however, most of the time this isn’t able to reach very far especially in windy conditions. Doe in estrous lure can work great at certain times during November, however, when bucks are already tending another doe it is very hard to pull them in with just using doe pee. 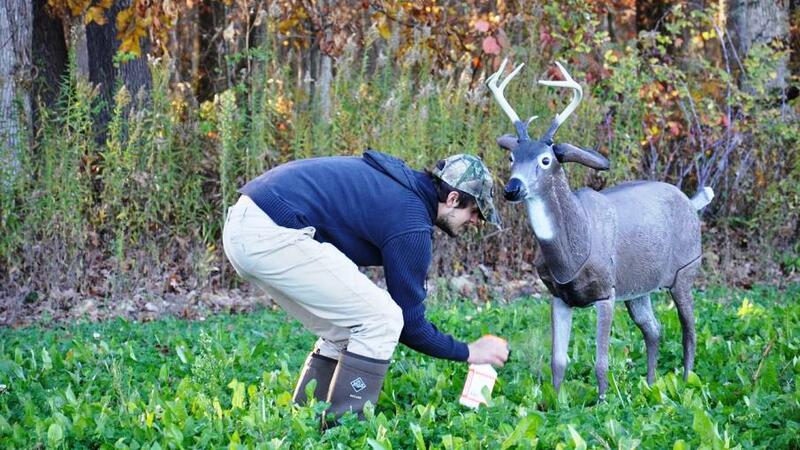 Most hunters choose to use their decoys as a buck. Whether a buck is cruising for does or even paired with a doe, during the middle of November it is hard for him to pass up a fight. Like with does, call and lures are the option, but the real advantage to the buck is the ability to call from long distances via rattling. Unlike a grunt call, rattling can reach out and get a buck’s attention from far off. When they come running, they expect to see other bucks. Why wouldn’t they? Often this can be the difference between a buck getting hung up, and passing through your shooting lane. It would be great if I could tell you that the use of a decoy is completely successful. But whether you encounter a 2 ½ year-old buck, or a giant 5 ½ year-old, there are times that bucks will simply be “afraid” of the decoy. This “deer in the headlights” and constant circling just out of range, can be one of the most sickening feelings. The “what ifs” begin to pop into your head. If the decoy wasn’t there would he have come into my shooting lane? It’s also extremely important to take precaution when setting up the decoy. Keeping it has human scent-free as possible, and making sure it is sturdy so that it holds up to the wind. If you have had issues getting bucks into range, then a decoy could be the best thing to close that gap and pull off the shot. Keep up with the last whitetail Rut hunts from Michael, Nick, and T-Bone on the Bone Collector Facebook page!